Help Wanted: Those who prefer to shoot first and ask questions later. Virtua City is looking to hire special detectives for missions that require fast trigger fingers. Recruits will be highly trained and put in great peril as they tackle the most dangerous missions to clean this city’s dirty streets. Are you man enough to be a hero? Play as special detectives Michael Hardy and James Cools and take on a huge job that will clean the streets of futuristic, man-made Virtua City. Again we travel to the lonely lands of Sega’s oft forgotten home console, the Saturn. 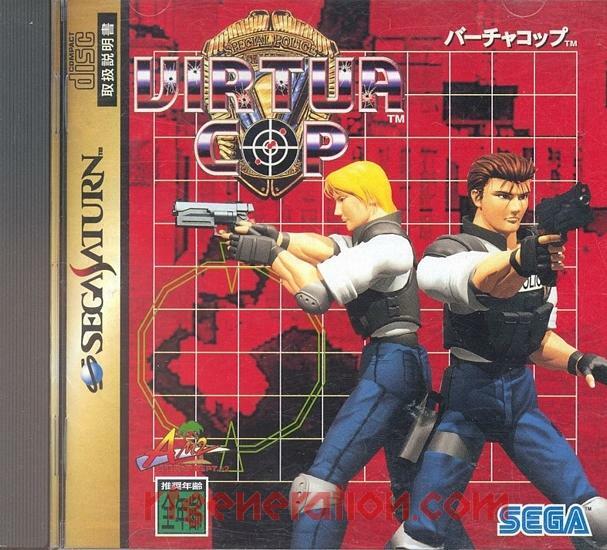 Virtua Cop started its life in the arcade and upon release became the latest in a long string of hits by Sega Amusement Machine Research and Development Department 2, or AM 2, in 1994. Virtua Cop is a genre defining game, as it broke new ground for on-rail light gun shooters by allowing far more interactivity with the enemies, based on where they are struck by a bullet. Different animations and scores come out for hitting different parts of the bodies of Virtua City’s criminal scum. The graphics are also full, 3-D polygons, which is obviously what Yu Suzuki and crew used after the massive success of Virtua Fighter a year earlier. Virtua Cop became the primary influence for light gun shooters after its release. Sega would use the game as the backbone for The House of the Dead, Namco came out with its long running Time Crisis series, and even Goldeneye’s aiming on N64 is basically Virtua Cop, admittedly so by the developers. This success is likely a result of the jump to 3-D, which made Virtua Cop feel much more modern than even the best 2-D, arcade light gun shooters that came out just a few years earlier. The extra interactivity adds a layer that makes the game feel fresh even though its based on patterns and memorization to get through the levels. The levels are the basic style of Sega’s arcade level design of the time, with a Beginner, Medium, and Expert stage. Many shortcomings for the Saturn are well known, but one thing that AM 2 nailed were the console ports of their own arcade games. When other teams were struggling to make use of the unique and confusing arrangement of the Saturn’s hardware, AM 2’s arcade ports were all games that are now staples of the modern Saturn collector’s library. Surprisingly, all these arcade ports are some of the most common and affordable games for the Saturn in all regions where it was released! Despite the less than stellar success of the Saturn outside of Japan, the arcade scene itself was experiencing a revival in North America at the time Virtua Cop released. Street Fighter II’s success got a new generation, myself included, to visit the arcades that had defined cutting edge game design and technology for almost 20 years. The remaining Western arcade developers took advantage of this revival to limp their way into the 21st century, while the Japanese developers flourished as a result of a stronger showing in what is only one of many markets for them. Playing the game and hearing the soundtrack again caused memories of sights and sounds of the mid 90’s to come flooding back. During this time, I started visiting my local arcades weekly until both of them closed their doors in the early 2000’s. Part of my revived sensation comes from the fact that Virtua Cop, enjoyed with the Saturn’s Stunner light gun, feels so authentic to the original arcade experience. The soundtrack is a giant dose of 90’s nostalgia, and fits the pacing of each stage perfectly. The action is wonderfully framed, and all the different enemy spawns and shooting timers make use of different reaction speeds and player instincts. The Saturn release has many different difficulties to select from, so you can play around and find the one that gives you the perfect challenge. Like all arcade games, practice makes perfect! 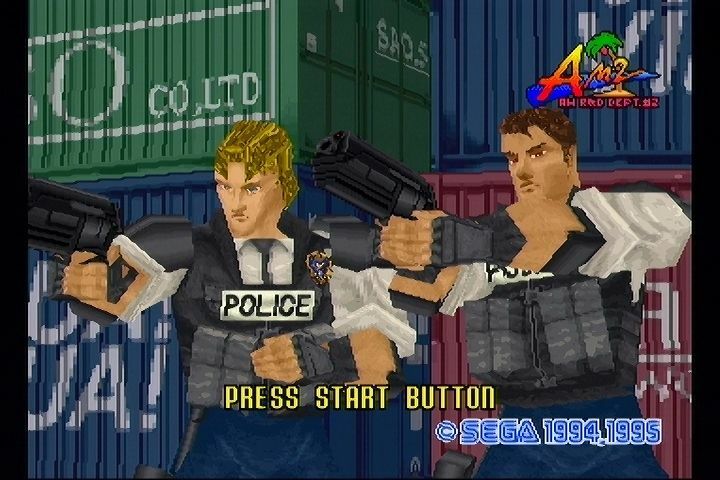 Standing up, shooting bad guys, and having to fire off screen, all with the non-stop action of enemies popping up in front of you, makes Virtua Cop stand out as one of the arcade classics of the mid 90’s. If you don’t want to haul around an arcade cabinet, then owning the Saturn port is a fine consolation. Another port was released on the PC a year after the Saturn release, but this version only has mouse support. Another version was also released by Tiger for its R-Zone.